Flowers are everywhere this Spring! Here’s a handcrafted bracelet idea for mom or someone special in your life that incorporates all those beautiful floral stamps you have. Fiskars Hand Drill made this project especially easy to drill small holes without the worry of breaking the small wooden discs. And Heidi Grace’s floral stamp set added beautiful detail in creating these ceramic like discs for this classic black and white bracelet. 1. Prepare 6+ wood discs by sanding any uneven edges or surface area and wipe clean. Note: prepare a few extra to be safe. 2. 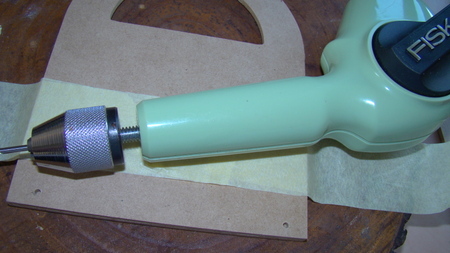 Evenly coat wood discs on both sides and let dry thoroughly. 3. Stamp one side of discs with Heidi Grace floral stamp designs and Stamp Blocks, let dry, then stamp designs on opposite side also. 4. Use the Fiskars Hand Drill to create 2 small holes on opposite sides of the discs – this is where the jump rings will be attached. 5. Coat discs with clear coat of acrylic or other sealer – a crackle finish gives the pieces a vintage touch. 6. Using pliers, attach jump rings to each drilled hole. 7. Connect the pieces with smaller jump rings. 8. Attach clasp pieces to end jump rings using pliers. 9. Create charms with head pins, silver filigree beads and black beads. 10. Trim head pin length if needed with Wire Cutter and use Needle Nose Pliers to create loop on end and attach to jump ring near clasp. Note: 6 – 1” discs with jump rings and clasp will create a 7 ½” bracelet. Other: 6+ 1” wood discs from craft store, white spray paint, sand paper, clear coat spray or crackle finish coating, jump rings, clasps, headpins, silver filigree beads, 5mm black beads. I have been hanging on to this tiny little tin for a couple of years now, you know just waiting for the day that i needed it for something, i know sad hey, lol!! Anyway it used to house mints and i actually went looking for them the other day but couldn't find them. However there are lots of other mini tins on the market that you could base this idea around, i'm sure. Firstly I used my Fiskars craft drill to drill 2 holes side by side in the back to attach the key chain to. I then painted the tin with a couple of coats of Heidi Swap paint, when that was dry i stamped using black Stazon ink on the lid and on the bottom. I also grubbied it up a bit by putting some stazon on a makeup remover swab and wiping it over. When this was dry i applied the Heidi Grace Rubons and then over the whole lot i sealed with some Liquitex gloss medium varnish. I popped into office works where you can print little photos, which were ideal. I have spoilt myself and made this tin for me for mothers day, just haven't managed to get a photo of me and my other half, but i still have a spot to put that inside on the lid, so I shall endeavour to do it. 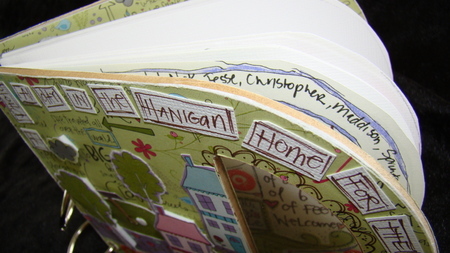 I made a little concertina piece to fit inside, the new flip and twist corner punch was perfect for doing the corners. I doodled my borders (as usual, lol!!) and added some colour by scribbling my tombow pen onto a tile and lifting the colour off with a water brush, so in effect using them as watercolours. New furry flocked flower paper !! The paper that i have used on the stem is also more paper you just HAVE to touch, all the little elements have a beautiful glittery finish. Both were perfect for this door hanger made for a birthday gift for one of Maddisons friends, Becca. For the "B" we painted it with a couple of layers of Heidi Swapp "betty" acrylic paint and when that was dry i stamped over it in black stazon using the paisley stamp from the new "Reagan's Closet" clear stamps from Heidi Grace. I must say if you are a lover of stamps, you are going to LOVE these!! I have acquired 3 new sets over the last week!! Anyway, where were we? After i stamped the black stazon and it was dry i put a wash of white over the top cause the pink was just a bit too heavy, when that was dry i coloured little bits with a white gel pen and added a bit of bling. My trusty assistant, Christopher was close by to hold the B, well actually we had a little tiff about who was going to drill, i won this time!! (usually its him!) Remember to drill into something thick as you can see you will drill right through the other side and into the table, craft mat or anything else that might be underneath...yes speaking from experience ;0) All ready to thread a piece of ribbon through to attach to the door hanger. See the furry bits on the flowers, cute hey? Well thanks for stopping by, will be back later to share my photo of the day for yesterday and today. and this month we would love for you to think outside the square and show us how you can use your tools in ways that aren't necessarily what they were intended for. Recently when i was visiting a neighbour i spied some lovely beachy driftwood mobiles hanging from her balcony. They were lovely shapes of driftwood, holes drilled and threaded with beads inbetween and they looked fabulous!! Anyway all of the above bits, even the shells were drilled using the Fiskars drill. You will need 2 people for this, and my 8 and 10 year olds managed it quite nicely, simply drill holes through the centres and thread onto fishing line. this is the finished product, we ended up with 6!! Needless to say the kids had an absolute ball and now on the to do list is a trip to the bead shop to make some more with driftwood and beads this time. think outside the square and show me what you can do to use your tools in a manner other than the obvious. Just inspire us to get the most out of our tools. 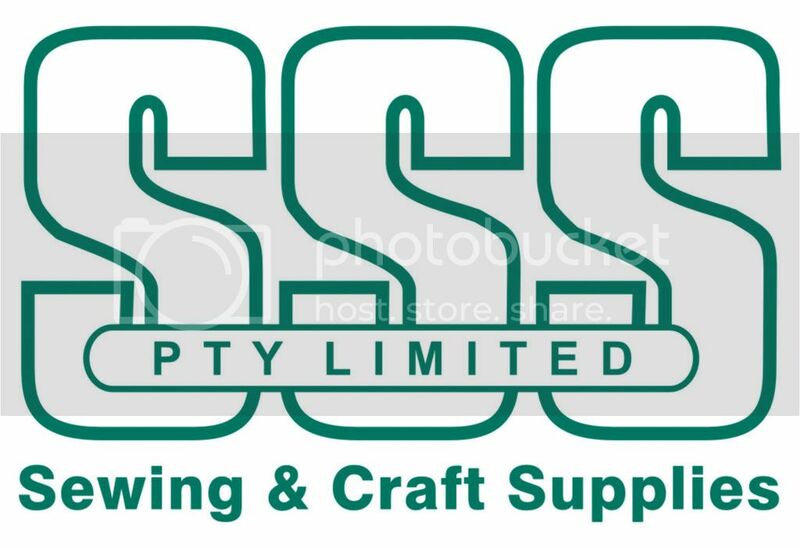 Use ANY tool in your stash and email photos to us at fiskarscraft@yahoo.com.au . Can't wait to see what creations you come up with, and you have the entire month of March to get your entries in. 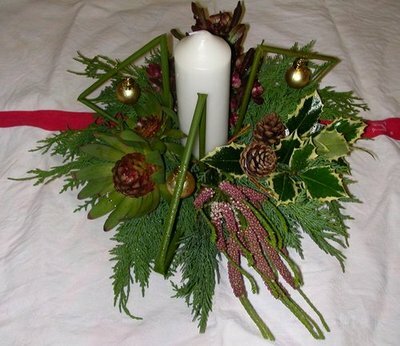 How about creating a Christmas Table Centre Piece this year by using "greenery" from the Garden! It's now 12 Days until Christmas so you have got time to play around and have -a-go at one of these! I have been playing around using some cyprus,holly leaves,some small pine cones and a few other bits and pieces from around our garden! I used a large round tray about 2" deep x about 10" and placed a soaked block of floral foam into the centre. It's important that you soak the foam block(usually green or fawn in colour) until it has aborbed the water......so throw it into a bucket of water for an hour or so first while you go picking your greenery from around the garden. 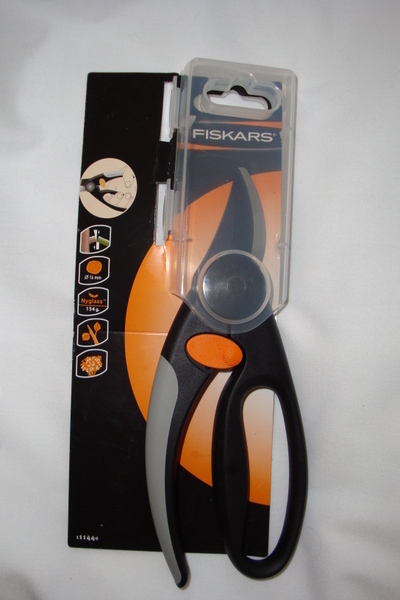 I used my NEW FISKARS Secateurs (thanks Nic).......had to hide these from my garden loving hubby......LOL! We now have a "HIS" and "HERS" pair........so it's hands off Rod.....ROTFL! Then you will need to trim the block so that you have some foam all around the inside of the tray.....so perhaps cut it in half and then trim up smaller pieces and place around the inside of the tray.....I used a sharp bread knife for this......sh...sh....don't tell my family.....LOL! Next I drilled.....yes drillled 3 holes into the bottom of the candle with my Fiskars Hand Drill in a triangle shape so that I could poke some bamboo sticks into the bottom. You'll have to trim the bamboo sticks to the desired height....then insert them into the three holes......and then push the candle into the foam......centering it ! Start arranging your greenery around the candle and then add some bent sticks or you could use long straws if you have some. I then added some little gold baubles that I had in my Christmas stash already. I'm going to create another one soon for my brother to use on Christmas Day.......so I'll share that also when it's completed. You could always add a bow or some ribbon near or around the candle for a little variation. It's just so nice to be able to bring some of the garden inside for Christmas! I recently purchased a small Kaiser wooden basket, and when i got it out the other day, i realised it didn't have the slots to slot it all together, and as the shop was an hour away i certainly wasn't heading back. 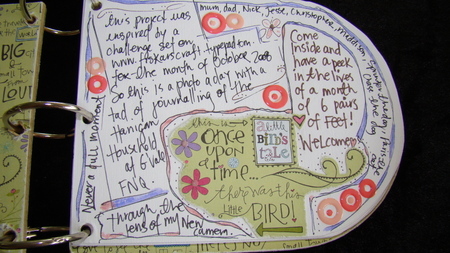 Instead i have altered it into a little album for my photograph a day!! 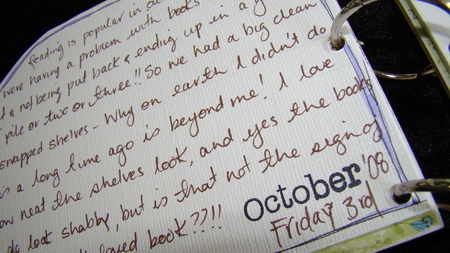 Perfect size for 1 page of journalling and the opposite the photo. 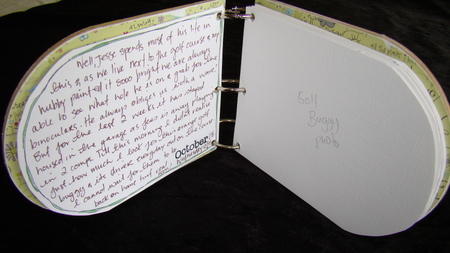 I have it all ready to go so that as i post each day i can journal as well, and at the end i will get the corresponding photos printed off and they just need to be added to the page. The little handles i have made into a window by adhereing acetate under the paper, as well as adding a little welcoming window it will help to protect the pages. I have made a little neighbourhood that reminds me of ours, our home is a highset Queenslander, not pink though lol!! The golf course is in the background with the little white golf ball and the putting green, with the trees and some raindots at the front as flowers. White Bazzill pages inside already to go. 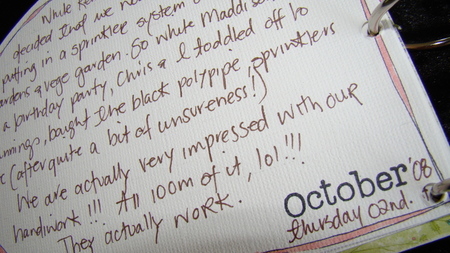 I have journalled in my own handwriting as well as adding borders with a thin black pen and colouring with tombow pens. 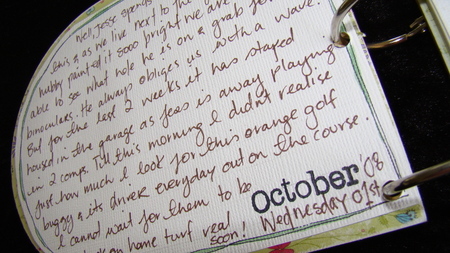 I have included the date on each journalled page and the opposite page is waiting for the photos to be added. 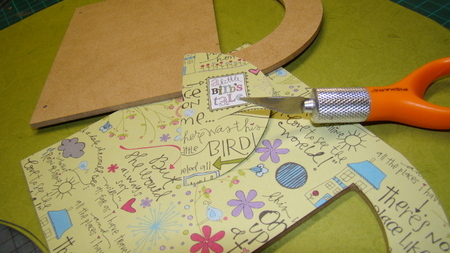 For this project i used Heidi Grace A Little Birds Tale range of papers and some cloud 9 design raindot pink eyelets, Heidi Grace Clear Stamps Tags and Words, the Fiskars craft drill and fingertip control craft knife, hole punch and eyelet setter. Its just over a minute long.